Howdon Metro level crossing in North Tyneside. Nexus staff Deborah Rodenby, John Naughton and Ken Herries with Stephenson Memorial Primary School pupils Sophie Tonge, Summer Ellis-Hall and Savanna-May Clark. Schoolchildren from the borough have been given the chance to design a series of level crossing safety posters which have been published in a new calendar. Nexus, which owns and manages the Tyne and Wear Metro, has created the calendar with drawings by pupils from two schools located near to Metro level crossings in Newcastle and North Tyneside have been involved in the campaign – Walkergate Community School and Stephenson Memorial Primary School. The pupils all had special classroom visit from Nexus to learn about the safe pedestrian use of Metro level crossings, including the new red safety warning lights which were installed across the system in December 2014. The children were then asked to design their own safety posters, with the designs being reproduced in a 2016 wall calendar that the schools will hand out to all of their pupils. 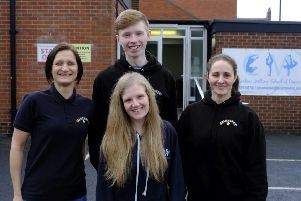 Nexus Youth Liaison Officer, Deborah Rodenby, said: “This campaign has been all about targeting the safety message at those pupils who regularly have to access level crossings to get to school. “I showed them the pedestrian stop lights and the dangers to watch out for when a train is approaching. It’s all about making them aware of the dangers and how they can use the crossing safely.